After showing the three shepherd children a vision of hell (the “First Secret” of Fatima) Our Lady told them that many souls would be saved from damnation if people embraced devotion to her Immaculate Heart. Mary said, ““You have seen Hell, where the souls of poor sinners go. To save them, God wishes to establish in the world devotion to My Immaculate Heart. If people do what I am going to tell you, many souls will be saved and there will be peace.” The Blessed Virgin Mary then revealed to them the “Second Secret”: “The war is going to end [World War I]; but if people do not cease offending God, a worse war will break out during the reign of Pius XI. When you see a night illumined by an unknown light [this happened in the Fall of 1938], know that this is the great sign given you by God that He is about to punish the world for its crimes, by means of war, famine, and persecutions against the Church and against the Holy Father. To prevent this, I shall come to ask for the consecration of Russia to My Immaculate Heart, and the Communion of Reparation on the First Saturdays. If My requests are heeded, Russia will be converted and there will be peace; if not, she will spread her errors throughout the world, causing wars and persecutions against the Church. The good will be martyred, the Holy Father will have much to suffer, various nations will be annihilated.” How many Catholics even realize that the “errors of Russia”, and not just communism but above all revolution and rebellion against God and the moral order he established, have indeed spread throughout the world, including America and Europe. The enemies of Christ today control all the “choke points” of western culture – the media, entertainment industry, publishing, fashion, arts, education, finance, and even control US and NATO foreign policy. They promote immorality in order to morally weaken and more easily manipulate and control the masses, and they thrive on endless war, and even talk about the need for a third world war in order to take total control of the world. Don’t be fooled by what you see on TV, be it the “liberal” CNN or the “conservative” Fox News. Don’t believe the enemies of truth when they speak of seeking to promote peace, freedom, and democracy while they commit mass murder around the world while they corrupt, oppress, and impoverish us. Believe instead the words of Our Lady of Fatima, who promised us the gift of “an era of peace” if only we heed her requests. And those are: 1. Renouncing sin and making reparation for our sins (and even those of others) by offering up our daily trials and crosses as a sacrifice to God rather than complaining about them; 2. Praying the Rosary every day while meditating on the mysteries; 3. Going to confession and Mass and receiving holy communion on the First Saturday of every month, or at least for five months (See “Reparation for the sins commited against the Immaculate Heart of Mary” at http://www.knightsoftheholyrosary.net/home-1/fatima-rosary/); and 4. 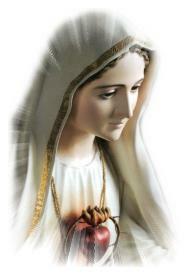 Pray daily the Fatima prayers, and offer up prayers and sacrifices for priests, bishops, and the pope, and pray that the pope will fulfill Our Lady’s request to consecrate Russia, in union with all the bishops, to her Immaculate Heart, which will bring about the conversion of that nation as well as an era of peace. Many people think that the consecration has already been done as requested. Even Pope John Paul II admitted publicly that it still needs to be done. We will talk about this important subject, as well as the “Third Secret of Fatima”, in our next article, and hopefully that will be soon. The author of The Secret of the Rosary and the originator of total consecration to Mary, St. Louis Marie Grignion De Montfort (1673–1716) remains one of the greatest apostles of Marian devotion the world has ever known. As a young priest, De Montfort dedicated himself to preaching to the people. This highly gifted orator’s language was simple but full of divine wisdom. De Montfort’s whole life was marked by constant prayer, love for the poor and holy joy in humiliations and persecutions. He was canonized by Pope Pius XII in 1947. This small book is an absolute gem. A gem for those who want to learn about the Rosary prayer as well as for those who pray it already. In simple language, this book is presented in the form of the prayer itself, with 53 short chapters which include stories from history, spiritual advice and preaching. St Louis writes with zeal about the Rosary: that which is not only important for increasing our love and devotion to Our Lord and Our Lady – but also, as given for our salvation, the combination of Our Lord’s Prayer and The Angelic Salutation (Hail Mary). On reading this book, one will gain knowledge of the origins of the Rosary in the appearances of Our Lady to Saint Dominic and his subsequent passion for preaching the Rosary. It also contains history of the passing of the legacy from Saint Dominic to Blessed Alan de la Roche and in turn to Saint Louis himself. The first two belonged to the Order of Preachers, the Dominicans who have a profound connexion to the history of the prayer. De Montfort himself was a Third Order Dominican. Saint Louis gives insight into the very real dangers of evil, unfortunately taken far more seriously in his time than in our own. This loss of such seriousness is a sad thing indeed! The images Saint Louis colorfully depicts bring to life these dangers, now so invisible to our sensibilities. He states that the Rosary is a necessary prayer to combat the evil one. Saint Louis’ writing is also very colorful regarding the many beautiful accounts of visionary experiences by people over the centuries through devotion to the Rosary, as well as of confrontations with demons. sure path to heaven, must we, in spite of ourselves, tell the whole truth and confess before everyone who it is who is the cause of our shame and our ruin? Oh, woe to us, princes of darkness. “Then listen, you Christians. This Mother of Jesus is most powerful in saving her servants from falling into hell. She is like the sun which destroys the darkness of our wiles and subtlety. It is she who uncovers our hidden plots, breaks our snares, and makes our temptations useless and ineffective. “We have to say, however, reluctantly, that no soul who has really persevered in her service has ever been damned with us; one single sigh that she offers to the Blessed Trinity is worth far more than all the prayers, desires, and aspirations of all the saints. We fear her more than all the other saints in heaven together, and we have no success with her faithful servants. “Many Christians who call on her at the hour of death and who really ought to be damned according to our ordinary standards are saved by her intercession. And if that Marietta (it is thus in their fury they called her) did not counter our plans and our efforts, we should have overcome the Church and destroyed it long before this, and caused all the Orders in the Church to fall into error and infidelity. There is an attitude amongst Catholics of today, that the Rosary is for the simple, even superstitious type of person. St Louis strongly warns against this attitude. I highly recommend this book to those who know nothing of the Holy Rosary and to those who know much. Simply put, the words of this saint bring with them grace from heaven. That of which he speaks, the true stories he recounts, and his zeal for this sublime prayer cannot but help one to reach for their beads and pray the Rosary, a most powerful spiritual weapon given to us from heaven. What is the greatest offense and worst insult one can give to a man? Is it not the defaming and insulting of his mother? Christ also is supremely offended and insulted when people do not believe in the divine privileges granted to his Mother Mary. And so he requests that we offer prayers and make sacrifices to atone or make reparation for the sins of disbelief committed against his Mother’s Immaculate Heart. The month of June is dedicated to the Sacred Heart of Jesus, devotion to which goes back at least over five hundred years but which gained much momentum after Jesus asked of St Margaret Mary Alacoque for the spread of this devotion in the 17th century. 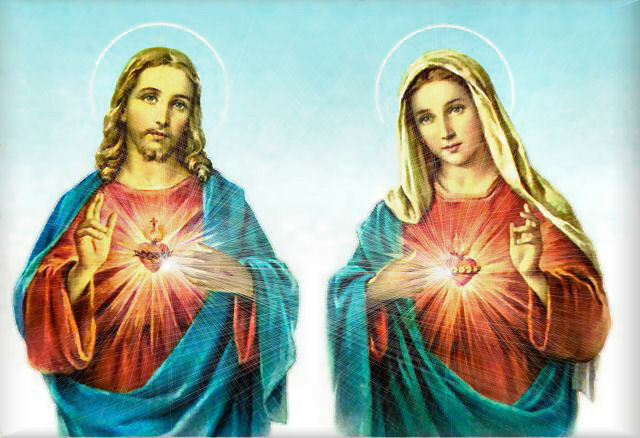 In the Message of Fatima we see that Jesus desires that the Immaculate Heart of his mother Mary be venerated together with his Sacred Heart. On February 15, 1926, the Infant Jesus appeared to Sr Lucia again. He asked her if she had already spread the devotion to his most holy Mother. She told Him of the onfessor’s difficulties, and said that Mother Superior was prepared to propagate it, but that the confessor had said that she, alone, could do nothing. Even a person wearing blinders today would realize that fashions in girls and womens clothing have become so sexually provocative and revealing as to constitute an extremely serious moral problem, reflecting an even more serious spiritual problem in our western culture, one that is infecting many Catholics as well. The evolution of women’s fashions in dress between 1920 and today has been nothing short of revolutionary. Today the tight-fitting and revealing clothing for women and girls is worn by a great majority, and even by most church-going Catholics. How many of them realize that when by their manner of dress they provoke a man to lust, they share in the guilt of the man’s sin, and are even more guilty than he is? Our Lord said, “Every one who looks at a woman lustfully has already committed adultery with her in his heart” (Mt 5.28). If the woman is responsible for provoking this lust, how can she be without sin, even serious sin? The Knights and Dames of the Holy Rosary believe that the virtue of modesty is the guardian of chastity. We always dress in a manner pleasing to Our Lord and Our Lady, and courageously defend the importance of this much neglected virtue, for nothing less than the salvation of souls is at stake. December 8 is the solemnity (and Holy Day of Obligation) of the Immaculate Conception, when the Church celebrates the day when the Blessed Virgin Mary was conceived in her mother’s womb (St Ann) without any stain of Original Sin. This singular privilege was bestowed upon Mary by God through the merits of Christ’s redemptive sacrifice on the Cross, which were applied to Mary before that sacrifice took place. Hence the angel Gabriel saluted Mary with the words “Hail, full of grace….” Being completely filled with God’s grace, there was absolutely no trace of sin, either Original Sin or actual sin, in Mary. This is a great mystery, but we know that God, who is outside the temporal order, and who knows all things and can do all things, can apply the graces of Christ’s redemption to Mary beforehand. 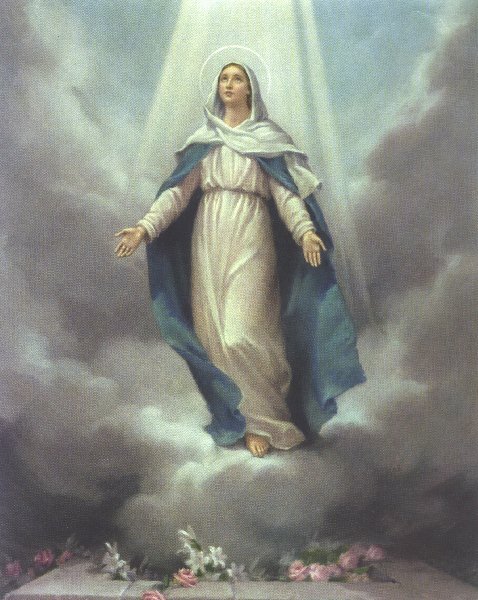 Mary’s Immaculate Conception was proclaimed a dogma of the faith to be believed by all in 1854 by Pope Pius IX. Mary’s Immaculate Conception is the source of devotion to the Immaculate Heart of Mary, and as Our Lady of Fatima revealed to the three children, “God wishes to establish in the world devotion to my Immaculate Heart,” and that “Jesus desires that the Immaculate Heart of Mary be venerated alongside his Sacred Heart.” In one of the Fatima prayers taught to the three children by the angel we see these words: “…and by the infinite merits of the Sacred Heart of Jesus and the Immaculate Heart of Mary, I beg the conversion of poor sinners.” There is a great mystery contained in this prayer, that of Mary sharing in a singular way in the infinite merits of Christ’s redemptive sacrifice. 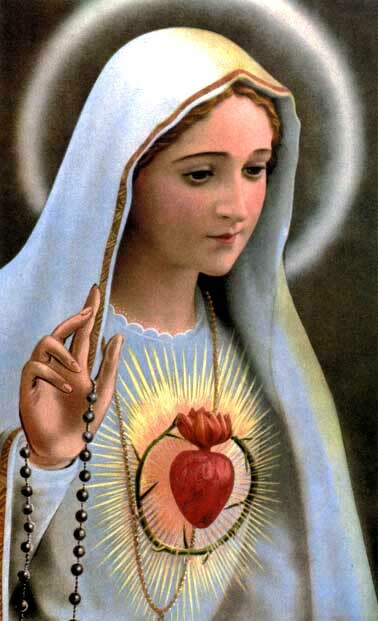 Part of the Fatima message is that God desires not only that we cultivate devotion to the Immaculate Heart of Mary but that we also pray (especially the rosary) and offer sacrifices and holy communions in reparation for the offenses committed against the Immaculate Heart of Mary. Hence the Five First Saturdays of Reparation (see this link Fatima/Rosary page at the Knights website). Most Catholics unfortunately haven’t even heard about reparation to the Immaculate Heart of Mary, even many who know something about the Message of Fatima. As Knights and Dames of the Holy Rosary we should not only fulfill the requests of Our Lady of Fatima regarding the First Saturdays of Reparation each month, but we should make this important practice known to others. The salvation of many souls and world peace depend in large measure upon the fulfillment of the Fatima message, and this is an essential part of that message. October is a little over half over, but it’s better late than never to mention that this month is dedicated to the Holy Rosary, and we are called during this month to be extra faithful and diligent in our devotion to Our Blessed Lady and her rosary. The Feast of The Most Holy Rosary on Oct. 7 was established by Pope Pius V after the greatly outnumbered Christian fleet defeated the Moslem invaders at the famous Battle of Lepant0 in 1571. The pope asked all Catholics to pray the rosary for this special intention, for the battle was crucial in preventing a Moslem takeover of all of Europe. The pope attributed the miraculous victory to Our Lady’s rosary. The Holy Rosary is, in St Padre Pio’s words, “the weapon” which Our Lady has given us in these “last times” to defeat our enemies: the spirit of the world, the disordered cravings of the flesh, and the devil, our chief enemy. The devil seeks our damnation primarily by using the “world” and the flesh, but Our Lady crushes his head underfoot, and her faithful servants armed with her rosary do likewise. Our website, knightsoftheholyrosary.com should be up and running with the store open within the next week. Thank you for your patience!